Here's my art for Hels Sunday Stamper challenge 189 with the theme of EYES. 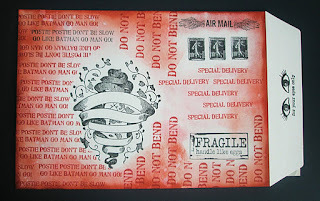 I don't have that many eye/face stamps so decided to go with this Darkroom Door Mail Art set. I've randomly stamped the images on/off an A5 envelope in Archival Jet Black and Vermillion and then blended over with Worn Lipstick, Fired Brick and Aged Mahogany Distress Inks. 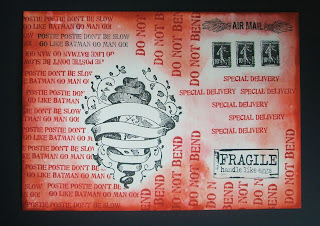 The 10c stamp is a Tim Holtz one. And where are the eyes I hear you cry... well they're on the flap!! Hope you like it. If you look closely you'll be able to spot my 'deliberate' mistake!! That Postie phrase always make me smile so I use it occasionally on my mail to give the postmen something to smile at too!! Like your mail art, and the secret eyes.